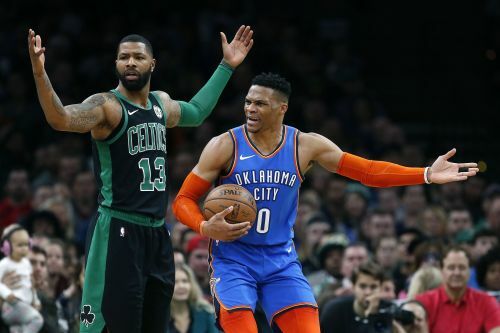 BOSTON (AP) — Kyrie Irving had 30 points and 11 assists, Marcus Morris scored 19 points and the Boston Celtics beat Oklahoma City 134-129 on Sunday to snap the Thunder's NBA-best seven-game winning streak. Ibaka has a career-best six straight double-doubles, Toronto's longest streak since Chris Bosh had eight in November 2009. All-Star guard Kyle Lowry sat out because of a sore back.